Emergency surgery to deal with the cancer removed almost the entire left side of his face, including his eye, his cheek bone and most of his jaw, leaving a gaping hole where his features had once been. 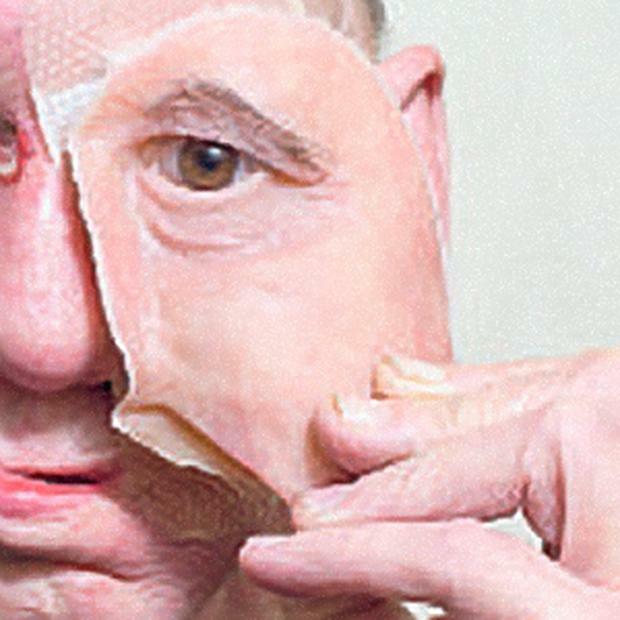 Now, after years of having people stare and recoil at his disfigurement, surgeons have employed cutting-edge three-dimensional printing technology to create a prosthetic face for Mr Moger, 60, in what is thought to be the first procedure of its kind in Britain. By making scans of what was left of his skull and using computers to recreate what his face would look like, they were able to use a new type of printer that builds up layer upon layer of nylon plastic to produce the components they would need. The prosthetic face has transformed the father-of-two's life, allowing him to drink his first glass of water and taste food for the first time since he underwent surgery to remove the tumour. Until now he has had to eat and drink through a tube directly into his stomach. "I was amazed at the way it looks," said Mr Moger, who lives in Waltham Abbey, Essex, with his fiancee. "When I had it in my hand, it was like looking at myself in my hands. When I first put it up to my face, I couldn't believe how good it looked. "Before, I used to have to hold my hand up to my jaw to keep my face still so I could talk properly and I would have liquid running out the side of my face if I tried to drink. "When I had that first glass of water wearing the prosthetic face, nothing came out – it was amazing." Three dimensional printers were developed by the manufacturing industry to produce prototype components quickly. Dyson, the vacuum cleaner and technology company, has made extensive use of them in research and development, but they have rarely been employed in medicine. Andrew Dawood, a dental surgeon and implant specialist, began using 3D printing a couple of years ago to help produce replicas of his patient's jaw bones so he could practise surgical procedures. Mr Moger was referred to him by Nicholas Kalavresos, a surgeon at University College London Hospital who carried out the life-saving but physically devastating work to remove the tumour. Attempts to use standard plastic surgery to rebuild Mr Moger's face had failed because of the chemotherapy and radiotherapy he was receiving. Instead, Dr Dawood used detailed scans to build up a 3D image of the bone left in Mr Moger's skull and of his facial features. Dr Dawood said: "We put the CT scan and facial scan together and used software to plan what we wanted him to look like." The scans allowed Dr Dawood to design a "scaffold" to replace the missing bone, created from titanium using a technique known as 3D milling, where a piece of metal is cut into shape by a computer. Screw-like 2in long rods were also made in a similar way before being surgically implanted into the remaining bone on the right side of Mr Moger's face, allowing the scaffold to be secured in place. A plastic plate was also created using a printed model of his skull to help form a seal at the top of his mouth, allowing him to eat and drink again. Computer software enabled Dr Dawood to create a mirror image of the right side of Mr Moger's face and using 3D printing he built up a facial shell made of toughened nylon.